From this passage, it appears that Yeshua is telling his disciples that the Torah prescribed a one method of dealing with offenses, but he is now prescribing a different one. Where the Torah endorsed strict, retaliatory justice, Yeshua endorses mercy and grace. But is this really what Yeshua is teaching his disciples? 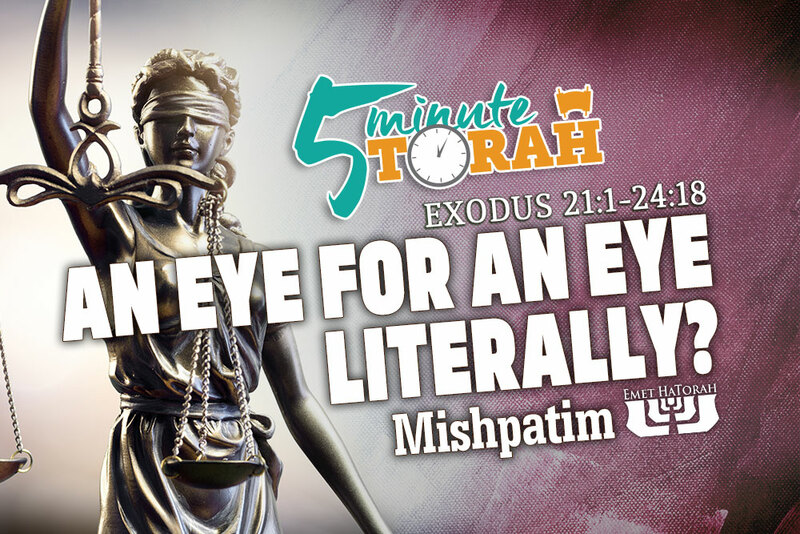 Was the Torah’s instruction of “an eye for an eye” taken literally in Yeshua’s day? The Talmud, although compiled centuries after the time of Yeshua, records how this principle has always been understood and practiced within Judaism. It says that a person should not entertain the thought that the biblical expression, “eye for an eye,” is to be taken literally. The Talmud makes it clear that retaliatory justice was never imagined by the Torah. Rather than literally gouging out the eye of an offender, the courts would evaluate the value of the eye of the victim and order compensation for the amount determined (see b.Bava Kamma 83b). So, when Yeshua makes the statement, “You have heard that it was said: An eye for an eye and a tooth for a tooth,” what is he trying to say? Is Yeshua overriding the Torah? Not at all. As we have noted, the Torah makes provision for repayment of damages. These laws served a two-fold purpose. First, they were for the protection of those who incur damages at the hands of others. Most importantly, however, they were for the person who was liable for the damages (the offender), to take personal responsibility for the harm of others. These laws were never created for retaliation from the one incurring damages (the victim). The Torah’s legislation addresses the offender. It instructs them how they should attempt to compensate for the damages they have caused, giving the court a basis of value by which it can define the compensation. What Yeshua does, on the other hand, is address the victim. By saying, “If anyone slaps you on the right cheek, turn to him the other also,” he specifically addresses the response of the victim, rather than the responsibility of the offender, who has already been addressed by the Torah. He makes it clear that when we are wronged—when we incur damages—we are not to demand restitution. We are to treat others with the same mercy which we would desire to receive if the tables were reversed. The Torah addresses the offender, while Yeshua addresses the victim. Yeshua upholds Torah completely, and instructs us on how to live beyond the letter of the Law to the greater spirit of holiness that the Torah embodies. It would honor our Master if we remembered this principle the next time someone wrongs us and we are tempted to demand our full legal rights.